Lady Cinnabar is a renowned Redguard scholar found inside the Imperial Sewers. 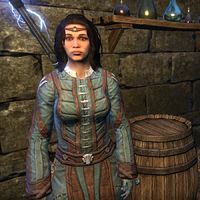 She is the author of multiple books and maintains a rivalry with fellow author Phrastus of Elinhir. You can find her and Phrastus at your Alliance Base. When spoken to, she will claim,"Phrastus is wrong about the Tel Var stones. "Don't look at them or they'll ignite ... everything is dangerous." No surprise, if you ever read his ... I suppose you can call them books. If they're a risk, we should study them to learn why." Why are Tel Var stones a potential risk? "The Daedra are scraping them from the White-Gold Tower. 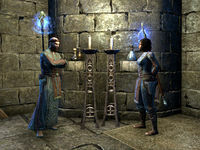 They still retain power from the days of Ayleid's construction, and I say we should turn it loose upon Daedra." What do the Daedra want with Tel Var stones? "As with any book by Phrastus of Elinhir, there is no clear purpose. But the stones have dorman power within. I believe, with proper study, we could learn more of the White-Gold Tower's construction. If the Ayleids could do it, why shouldn't we?" I thought the Ayleids did terrible things. "Yes, you could focus on a handful of negative aspects, completely discounting the thousands of advances both magical and mundane. Or ignore the foundation of civilization itself. Have you spoken with Phrastus? You'd get along swimmingly." You're Lady Cinnabar of Taneth? I've read your books. I prefer your books over those by Phrastus of Elinhir. "Oh, his books are better on cold nights. He meanders aimlessly as he writes, doubling his page count as he fails to find his point, and the cheap ink within comes from a pleasant berry. It helps the campfire last longer and smell far sweeter." Phrastus of Elinhir's books are better than yours. "You're in a sewer. You've thrown in with this lot, hoping to win a three-sided war while the Daedric invasion of Tamriel carries on above you. You'll forgive me if I find your judgment ... lacking." This page was last modified on 4 July 2017, at 13:48.